On maneuvers, the USS Michaelson's sister ship, the USS Maury, is wracked by devastating explosions that destroy its engineering section. Lieutenant Paul Sinclair is overjoyed when his girlfriend, Lieutenant Jen Shen, is found alive--until she faces court-martial for the disaster on the Maury. Paul must find out what really caused the explosions. But the more he learns, the more he faces the terrible possibility that the woman he loves may be guilty of sabotage and murder. Rule of Evidence was originally published as "by John G. Hemry". Listen to more JAG in Space titles. 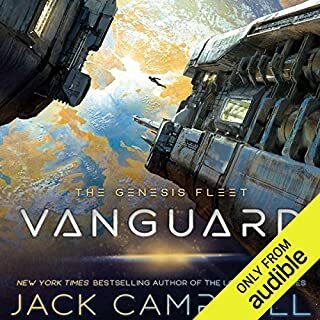 ©2005 Jack Campbell (P)2009 Audible, Inc. 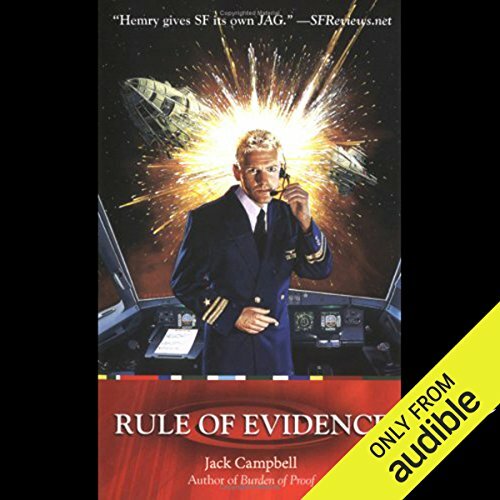 I am enjoying this military justice series by Jack Campbell. I like military justice books and military court room drama. The first half of this book covers the routine life on a USS Naval space ship. Situation may be heading toward war and the allies on earth are conducting naval exercise to show the enemy they can work together. I enjoyed the British ship with a women captain play chicken with the interfering enemy ship. An explosion occurs on the USS Maury the sister ship of the USS Michaelson. Lt Paul Sinclair stationed on the Michaelson and his girlfriend Lt Jen Shen is on the Maury as an engineer. The explosion is in engineering and the Michaelson comes to help. The second half of the book is court room drama as Lt Shen is accused of sabotage it appears she is accused because she was the only survivor from engineering. The suspense builds trying to defend Shen when there appears to be no defense available. I enjoyed the suspense and drama along with the moral dilemma. If you like this type of book you will enjoy it. Campbell is a great story teller. Nick Sullivan does a good job in narrating the story. The JAG in space series is really only good for those people who like courtroom dramas. Like all of the series there is nothing in the story that is particularly science fiction - it happens to be a court room story that involves a problem with a space ship. In this story the actual case seems to be very improbable and it is disappointing that the defense is so poor that no credible or plausible witnesses are found and the really obvious defense argument [that if it so much equipment was tampered with how could it have occurred in such a way that everyone not notice it in any way?] is not even addressed during cross examination. To enjoy this story you really need to like stuff that goes on in a court room. By this time (the third novel in the series) the mundane stuff has become a little tiresome and seems like padding; weighing too heavily against any action that occurs. With about a third of the novel dealing with the courtroom stuff directly I would have liked better development of the arguments and the resolution is far too obvious and predictable, especially with the patently poor prosecution case. Still there is some interest in the resolution of the case. If you're looking for science fiction or space drama this book and this series is definitely not for you. However, if you have some spare credits you could certainly do worse than this book. 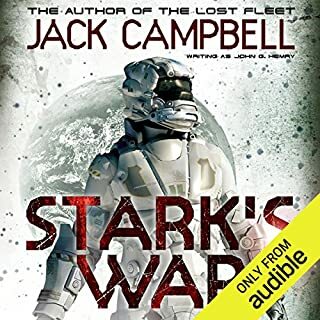 If you have read my other reviews, then you know I am a solid Jack Campbell/John Hemry fan. This book just reaffirms it. 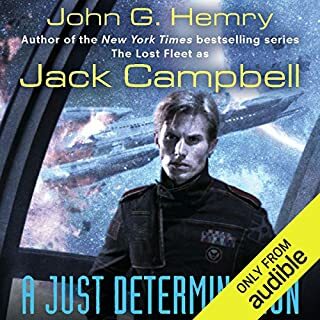 For my comments on the series as a whole, please read my review of Book 1 "A Just Determination." This fourth book (and its not the last -- there is a short story in the "Swords and Saddles" anthology) has a different approach in that while the first three pit Paul Sinclair against a villain, here there is a false accusation against his girlfriend, Jen Shen. This has resulted in complaints in some reviews that it is too predictable. If your approach to every book is to try to guess the ending, I can see how you might feel that way. But the story here is found in the process. When it looks like Jen will be accused of a disaster on a sister ship, Paul goes to the one lawyer he trusts, prosecutor Alex Carr. To his dismay, she shuts him down. Why? It turns out she is prosecuting Jen. Where JAG In Space started as a crime-courtroom thriller series, in this book, that pattern becomes a vehicle to get to a story about loyalty and fair treatment. What are a lawyer's responsibilties when they come into conflict with loyalry toward friends, particularly where the lawyer has real reason to b know that the facts must be different than what first meets the eye. This Author is one of my favorite authors ever. 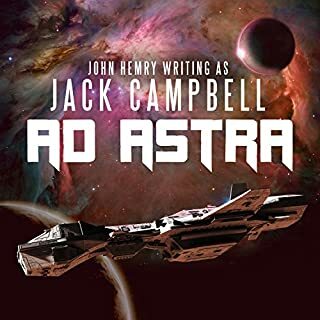 Its clear he enjoyed a very illustrious military career when you consider how detailed his writing is, and as one of those people who likes have some significant amount of fact and science with his "Sci-fi" I thoroughly enjoy the Jag in space series. This one however had me reeling in some sections due to seemingly obvious arguments that could have been made by the "defense" attorney of the accused that were not made, seemingly to allow the story move further or just to maintain the tension. besides that, this was another good story in the lost in space series. With this third in the series, we continue the pattern of action/character building in the first half of the story and then the trial in the second. It's a formula that works and once again the unrealistic tv-courtroom drama is (mostly) avoided in favor of an engaging but grounded court martial trial. Story: Paul's hope-to-be fiancée Jen Shen is working in the engineering department aboard the Michaelson's sister ship Maury. After a routine exercise testing new stealth equipment, the Maury disappears in an explosion that takes out most of the ship. Jen is the only survivor from the Engineering department - creating suspicion that she was the cause of the explosion. Paul will have to use all his resources to defend Shen and save her from court martial - or even the death sentence. Admittedly, this was the least favorite of mine for the series. Although still as engaging as the previous, the cause of the accident was obvious and completely overlooked by everyone. It made the lawyers, who had hitherto looked quite competent, look rather silly. And, ok, if you've read a Campbell book, you already know that military hardware is inherently unreliable - explosions are more likely to be the cause of manufacturing problems than a bomb. So I had a hard time with the credibility of a trial that purports malice rather than incompetence - even considering the possibility of coverups. All the same, Campbell brings in some strong pathos here. The loss of comrades is never glossed over and Jen gets to be both strong and very vulnerable. Paul does ride a white charger to save the day (sadly - it was a bit too deus ex machina) but I enjoyed the book all the same. 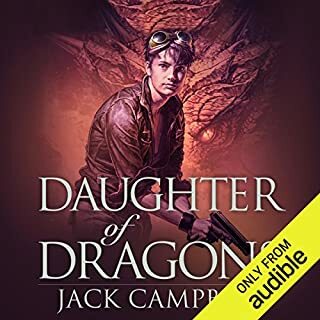 I listened to the Audible version of this book and the narrator did an excellent job. 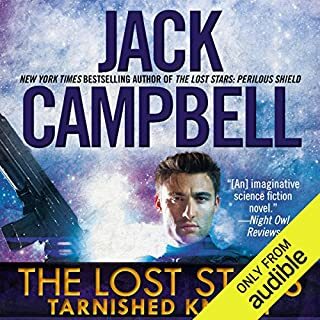 What was most disappointing about Jack Campbell’s story? I loved the other 3 JAG in Space books but there were some logical flaws that I can't get past. His point is that often scapegoats are found and evidence is manipulated in such a way to protect the people really responsible. So far so good. The problem is that the setup in THIS book requires too many suspensions of disbelief. Lt. Shen is accused of having set up all the equipment in Engineering to fail simultaneously to sabotage her ship. Experts show that she was one of only a couple of people who could have done that. But Mr. Hemry (Jack Campbell) ignores the questions of how long it would have taken her to do this and wouldn't there have been obvious modifications in the equipment that would have made others suspicious. Every time the dialog reached the point where this was the next logical issue it was ignored. I found myself yelling back at the audio. A real shame and I hope someday he comes back to military justice as the main theme. In the meantime I will keep anxiously waiting for more Lost Fleet books. Have read the whole series, new to hear more on this from Jack Cambell. I loved every one of them. As retired lawyer, I enjoy the legal basis of this series. As a retired Coast Guard officer, it drives me to distraction that Jack Campbell calls doors "hatches." Doors are between compartments on the same level while hatches are between compartments on different levels. On ships, doors can be watertight or non-watertight. Maybe the author is trying to make things sound more nautical. The story was disappointing because you know what the ending will be as soon as the defendant is charged. courtroom drama is not as good as the first two books. perhaps because it was about saving an innocent and not serving justice.